On CBC Radio “This is That”, “Wilderness Childbirth” was lauded as the way to go. Intrigued, I was picturing a cozy forest floor, moss covered, not so bad. Then the group leader, guiding four couples raring to be super natural, metioned that they shouldn’t be too preoccupied with the rain, because by the time they arrived at their birthing destination it would be snowing. Hmmmm, ok. Each couple was reminded to bring their skins and their field guides. They were to beware of coyotes in the area and were reminded to quickly go on a 1 km hike after the birth, so as not to attract any grizzlies. All this, and don’t forget to attend the first aid talk, since they were 700 kms from the nearest hospital. Suddenly, wrestling my 7 lb salmon into the fish poacher didn’t seem so daunting. Poached Salmon is absolutely delicious if done right. 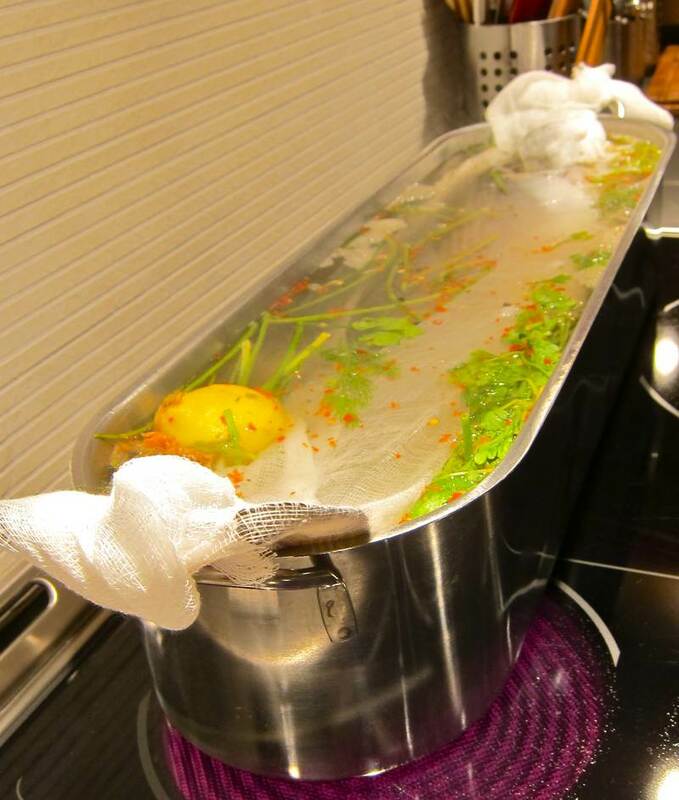 Wrap the fish lengthwise in cheesecloth, to make it easier to submerge and elevate from fish poacher or pot. Cut cheesecloth long enough so that you can grab onto the ends when lifting the fish. Bring the water and all above ingredients to a boil. Congratulations, you’ve just made a court bouillion. Submerge the salmon, bring back to a boil, then simmer for about 20 minutes depending on the size and thickness of your fish. There are several signs of doneness: The fish is cooked when a meat thermometer embedded in a thick part is between 125 and 140 degrees. As soon as the colour goes from deep coral to soft pink the fish is done. When the flesh is flaky, the fish is cooked. Remove the top skin after cooking. Use a small sharp knife to loosen it, then peel it off. Go through back bone to remove small bones along the edge. At this point, if the fish is just slightly underdone as you peer deeper into the interior, you may spoon some of the hot boullion over it, to get it to the perfect point of just cooked. Overcooked fish will be dry, you don’t want to go there. 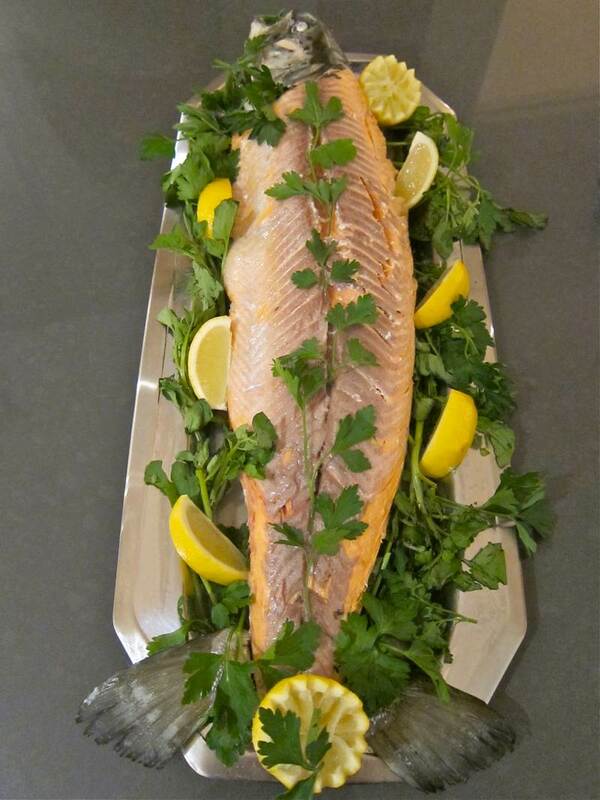 Serve the fish whole, warm or cold on a long, long platter, garnished with lemons and parsley. Serve the upper part of the fish first, then remove the bone in one piece. It can rest at room temperature for an hour after cooking before serving. 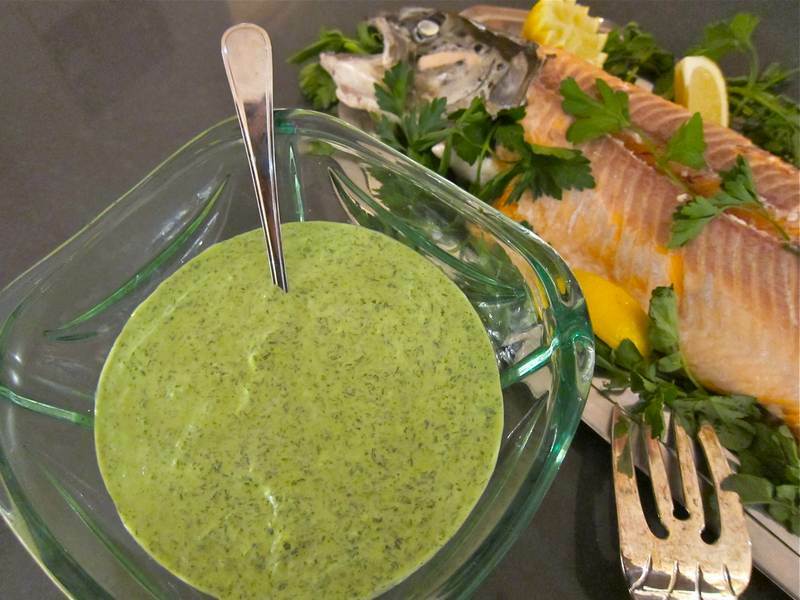 Poached salmon is incomplete without the accompanying bowl of delicious Sauce Verte, recipe below. Chop all the greens until finely minced in a food processor, or by hand. Yogurt, lemon, mayonnaise and seasonings are blended into the greens. Mix all ingredients except for the Dijon and the sauce verte. Toast or grill bread, then spread with some mustard, a good portion of salmon salad, topping with some sauce verte. 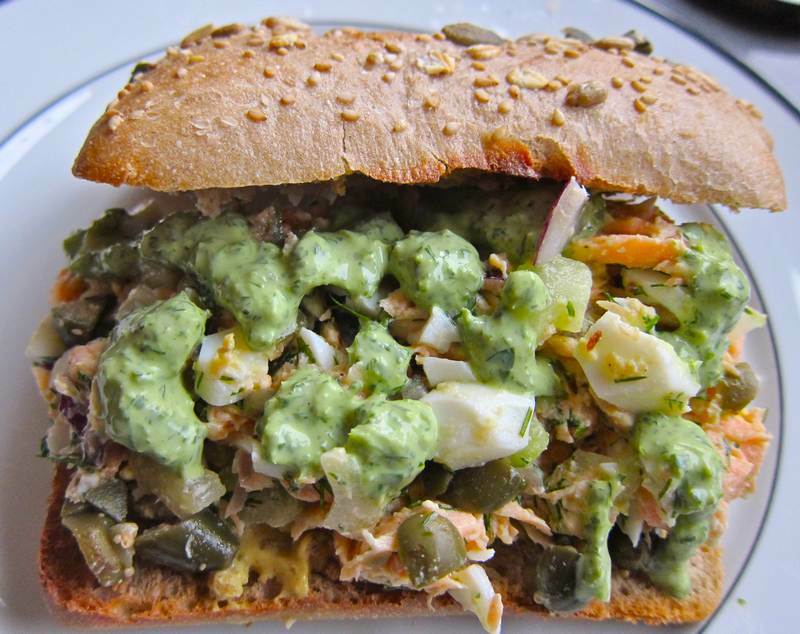 Great to prepare a delicious salmon salad sandwich without globs of mayonnaise. Thanks to Julia Richardson for the wonderful Sauce Verte recipe. I ate the delicious fresh salmon salad sandwich for lunch yesterday. It was so flavourful and the addition of the sauce verte instead of mayonnaise kept it light, fresh and extremely tastly. I totally recommend this use of leftover salmon. Thank you Jittery Cook for a fantastic blog with great ideas and recipes! That was one delicious sandwich. To be reproduced at a later date. When I started this blog I wanted to remember what I made that came out great. Now that the blog is rolling, I seem to just want to keep making new recipes to blog about. Interesting…. Holly,I can’t wait to try this. 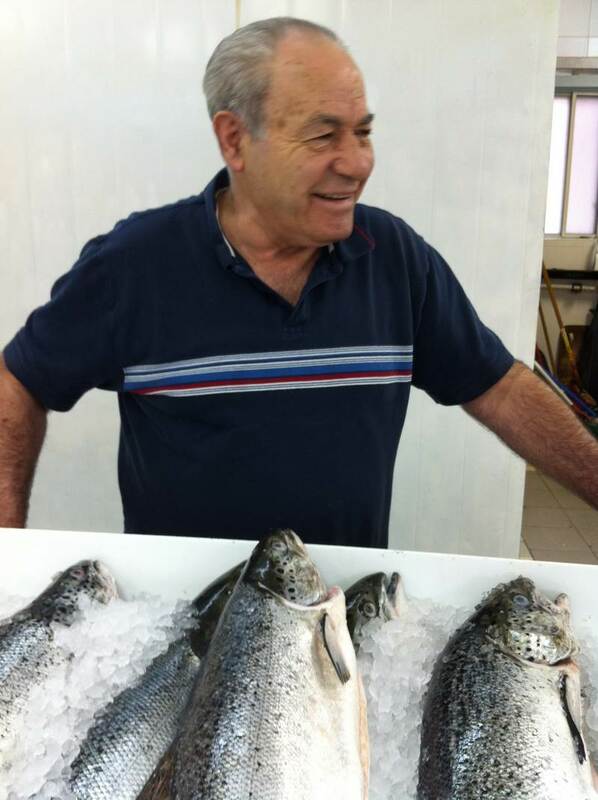 How can you poach the fish without the poacher? You can poach firm fish of any size or shape in a regular pot, scooping it out of the court boullion when it is ready, or sooner to check for doneness. The cheesecloth may be used, or you can lift it out gently with a large spatula or two. now I know what to have for lunch!